It’s an exciting time for the Fish Systematics and Biodiversity Lab! Two recent awards will be helping to pave a way for new, cutting-edge research involving our very own UW Fish Collection. Established in 2014, the UW Innovation Awards have helped fund a total of 16 faculty projects with an approximate $3 million supporting ground-breaking research in areas such as education, health care, and now fisheries. A joint project proposed by Dr. Chelsea Wood – a parasite ecologist and fellow Assistant Professor at the UW School of Aquatic and Fishery Sciences – and Dr. Luke Tornabene, was selected to receive $296,067 over the next two years to understand long-term change in parasitism of Pacific Northwest fishes. 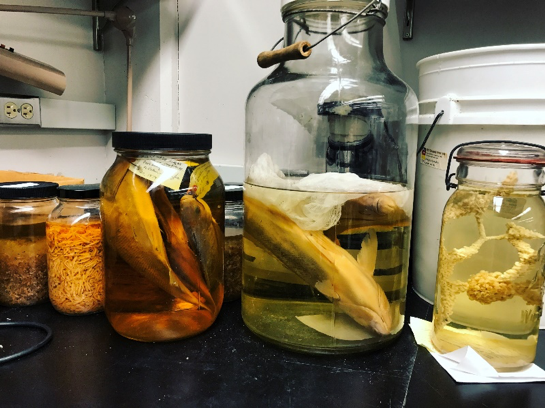 The proposed project will use specimens from the UW Ichthyology Collection for parasitological dissections – a method pioneered in Wood’s lab. To help fill the gap in historical records of marine outbreaks, parasite assemblages will be reconstructed for 10 species of Puget Sound fishes from 1880 to the present day, with the species identification and number of parasites found on these specimens recorded. Why might this be important to study, you ask? Though outbreaks of marine diseases have become a regular occurrence, the lack of historical baseline data of these mass-mortality events have left scientists at a loss for assessing the frequency or severity of these events. By generating baseline data, Wood and Tornabene hope to determine whether marine epidemics are increasing in frequency and magnitude, and therefore predict not only the time but the location in which these events might occur in the future. In addition to the UW Innovation Award, a recent $2.5 million grant from the National Science Foundation will help to fund a project of which will shape zoological-specimen-based research for generations to come. Over the next four years, UW and 15 other institutions from around the world will CT scan an approximate 20,000 museum specimens in hopes of creating a digital encyclopedia of all known extant vertebrates. As one of the largest fish collections in the world, the UW Ichthyology Collection will be making considerable contributions to this project by partnering with researchers at Friday Harbor Laboratories (in San Juan Island, WA) to #ScanAllFishes. After digitizing these museum specimens, those involved will then publish the scans for anyone who might wish to view them – including other researchers, students, and the public! The implications of these two awards are astronomical. The products from these research projects will go on to benefit the masses by allowing public-access to never-before-seen research and helping predict marine epidemics which have the potential to impact multiple facets of every-day life – such as public health and ecosystem services. Our natural history museums act as bridges between the scientific and public communities! By continuing to fund projects that involve the use of specimens from natural history museums, we’re proving that these collections are worth more than the occasional trip to a museum on a rainy day. These specimens can be utilized for far more than just systematic-based projects… perhaps even projects that have the potential to change the field of environmental science as we know it. So congratulations to all those involved in these two ground-breaking research projects! Make sure to check back frequently for future updates as we progress in our research! Older PostThe lab heads to Rochester NY to showcase latest research!